The Rav was born (1913) in Kashau, Czechoslovakia, his father Rav Meir was the Zhidichover Rav of Kashau. As a child, he studied under Rav Shaul Brach, the Kashauer Rav. After his marriage, he replaced his father-in-law (who had moved away) as Kiviashder Rav and established a yeshiva, which ran for six years, until the Nazis arrived in 1944. It is believed that his FIL offered him the Rabbanis as a wedding gift. In 1944, the Rav was deported to Auschwitz and later Bergen-Belsen, where his parents, wife, and three young children were murdered. In the aftermath of the Holocaust, the Rav married his wife’s younger sister, established a beis din that assisted hundreds of agunos, and arranged education of many orphans. In 1950 he moved to the United States and settled in Forest Hills where he opened a Beth Medrash. In 1953, under the auspices of the Satmar Rav, he established the Central Rabbinical Council of the United States and Canada. Not it is believed, put it was given to him as the dowry, not every body wanted to sign the Ksav Rabones, so they brought down the Spinka Rebbe the Chakal Yitschok for a Sheva Broches & the Ksav was placed on the table in front of him & he only gave L’chayim to the ones who signed. His FIL at the end did not move away. Cool story, it says a lot about his FIL. There is more to it, but not every thing can be publicized. What are you saying, its not such a cool story? does anyone know what was the name of his first wife? 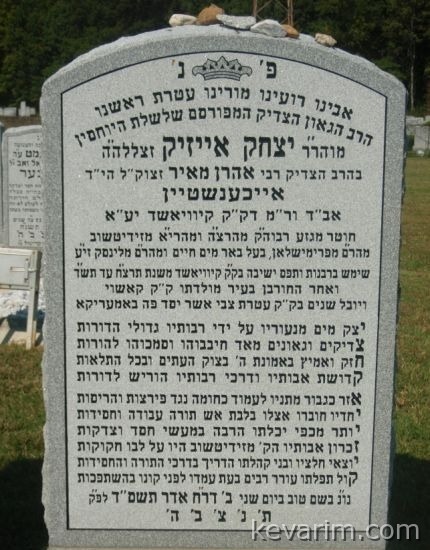 His first wife was Mindel, the eldest daughter of the Kiviashder Rav, ZT”L. which Kiviashder? The Rebbe Elozor? I am looking for people who pray in this Schul(in Queens) in the 60s,70s and 80s where R Eichenstein was the Rabbi. My grandfather attended that Shul and I would like to contact people who might have know him! Thanks! was niftar in ה’תרע”ד, whereas my letter was written in the 1960’s. ? is the Zhmigrader Rebbe from Williamsburg, son of Rabbi Arye Leibish Zts”l from Bne Brak, author of Arie Shoag.